Even if you brush and floss your teeth regularly, you may be faced with certain oral health issues in your senior years. Taking medications, wearing dentures, and battling certain medical conditions can all have a negative impact on your oral health. You only get one set of permanent teeth, so it is essential that you take steps to properly care for them for your entire life. • Dry mouth. Dry mouth results from reduced saliva flow that can be caused by certain medications, cancer treatments, and diseases. • Darkened teeth. Many older adults experience darkened and stained teeth, some of which are caused by changes in the dentin. A life of consuming foods and beverages that could stain the teeth also contributes to discoloration, as does the thinning of the outer layer of enamel. • Root decay. Root decay is caused when the tooth roots are exposed to acids that cause decay. The roots may be exposed by receding gums. • Gum disease. Gum disease is caused by plaque and will worsen the longer it is left on the teeth. Poor-fitting dentures and bridges, unhealthy diets, and certain diseases can also lead to gum disease. In severe cases, gum disease can result in tooth loss. • Denture-induced stomatitis. When dentures don't fit correctly, or when an older adult has poor oral hygiene practices, inflammation may occur in the tissue found under the dentures. Fortunately, poor oral health isn't inevitable as you get older, and there are a variety of healthy habits that you can employ in order to protect your teeth. Brushing and flossing your teeth day is essential for your continued oral health. Even if you haven't had a cavity in years, your cavity risk will actually increase with age. Dry mouth is one of the major reasons for this increased risk, as dry mouth is a common side effect of prescription medications. Be sure to brush your teeth at least twice per day using a soft-bristled brush and fluoride toothpaste. You may also want to consider an investment in an electric toothbrush. If you have partial or full dentures, it is important to clean them daily. Bacteria can stick to the dentures just as they would stick to the teeth, so be sure to clean them with specialized cleaners intended for dentures. Never use household cleaners or toothpastes intended for natural teeth when cleaning your dentures, as these cleaners are too abrasive and can damage your expensive dentures. It is never too late to give up smoking, which is especially detrimental to your oral health. Smoking can lead to gum disease, decay, and tooth loss, and it will impede your body's ability to heal after you've had a dental procedure. Talk to your dentist or doctor about programs that may be able to help you quit for good. Regardless of your age, drinking water containing fluoride can help to prevent tooth decay. Fluoride is a natural cavity fighter, and many municipal water systems have added fluoride. If you would prefer to drink bottled water, check the label before you have a drink, because there are some brands that don't contain fluoride. Visit your dentist every six months for cleanings, and don't wait until a problem pops up or you start to experience pain. As you get older, the nerves within your teeth will become less sensitive, so by the time you experience pain, it may be too late to save a tooth. Your dentist can also screen for serious oral health conditions, including gum disease and oral cancer. 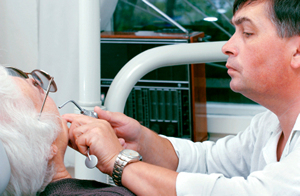 Please contact us if you have any questions about oral care for older adults.